This guide will help you configure kvm server, and configure a virtual machine inside that server. Navigate to VMM Addon – WHMCS top menu -> Addons -> Virtual Machine Manager. Specify your KVM host physical server login details. Note that we are using SSH to login to the KVM server. Your WHMCS user must be able to login to the KVM server without prompting for password. We’ve created a guide about it here: http://www.server.net/doc/appendices/rsync (rsync is not needed, but this guide will help you setup the connection). * If your WHMCS server has a firewall, make sure to whiltelist your KVM host ip address for in/out communication. The physical host is the server that holds the virtual machines (multiple machines), and not the end user’s virutal machine (this will be configured later..). First, the client’s virtual server should be properly configured inside WHMC’s Products/Services. Edit your server (or create a new one). Make sure that the client’s hostname is exactly the same as the server name in KVM, if they don’t match, Virtual machine manager will not be able to find your server. You can get the virtual machine server name in KVM using “virsh list –all” command. At the bottom of the screen, under the “Type” section, choose “Virtualmachine“. Next, navigate back to Virtual Machine Manager -> Servers tab. Your virtual machine should now appear in the server’s list, but it will be in an “Unknown” state. All you need to do now, is to choose “KVM” plugin, and the appropriate physical host (we configured it in step one). 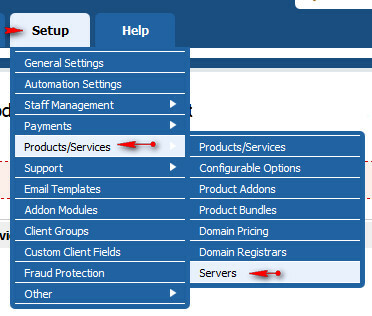 To assosiate the server to a client, just choose the server in the client’s “Products & Services” tab, and the client will be able to manage the server through his WHMCS client area.